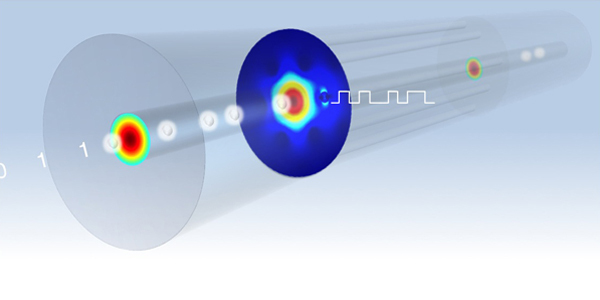 MRSEC researchers have developed the materials necessary to embed GHz speed electronic photodetectors into micron diameter channels in optical fibers. Electronic devices are usually made on planar chips or more recently by coating the outside of tiny semiconductor nanowires with layers of new semiconductors to form interfaces known as junctions. Junctions are at the heart of modern optoelectronic devices, such as solar cells, diode lasers, and photodetectors. MRSEC researchers used high-pressure chemistry to construct long, symmetric, precisely doped junctions by layering materials inside fiber pores. Two cornerstones of modern technology, optical fibers and electronic devices are merged in a way not previously possible. New technologies for electronically detecting, generating, and manipulating light in onedimensional geometries may arise from this research.